Consecutive Sundays and totally different conditions. On a cold and damp day two Spartans set off on an adventure to Wimbledon Common. They didn’t find any Wombles but Angie Keeling came home with a new PB (personal best) by 41 seconds of 2:14:01. She said “I really enjoyed the race”. Erica Grayson finished in 15th in her age category (W40) in a time of 1:56:36 three weeks after completing the Ibiza Marathon. The course was on open roads and was quite congested but the crowds were supportive and thankfully the rain held off. Further north TIM SABAN ran the Chester Half in a time of 1:28:51 and got fifth place in his age group. Often the Flitwick 10K is a last race before the London Marathon but this year the 30th Anniversary event came a week later which felt very different. JIM BROWN said there was a massive contrast with last Sunday – this week it was drizzle or rain and about 7 degrees. Not fair! Despite being slightly spooked by the start being exactly 26.2 miles from home Jim finished in a year’s best of 50 minutes 11 seconds and PENNY SCHENKEL in a year’s best 57:05. There were in 823 finishers in the club organised event where runners got extra entertainment from a veteran car club rally going in the opposite direction. What a difference a few days can make! After the furnace of the London Marathon five days earlier Spartan JIM BROWN was back in the capital city for the Last Friday of the Month 5K around the Serpentine in Hyde Park. It was cool, with a light breeze, dry but damp underfoot and he finished in 27 Minutes 28 seconds. PENNY SCHENKEL chased him down the last 200 metres for a year’s best 27:29 but the fastest Spartan was CIARAN McANENY who finished 28th in 18:07. There were 267 finishers in the lunchtime event. Six days after completing the London Marathon in less than three hours GRANT RAMSAY took part in the 3000 metres Steeplechase at Lea Valley. This was in the London Interclub Challenge, where Ramsay (as a guest) finished fourth out of 8 in a time of 11:45. He said “It was a good opening race for the track season”. This weekend’s parkruns saw loads of Spartans skipping a Saturday lay in to do a 5K run. Stuart HAYCROFT was second place finisher at Stevenage in a new PB (personal best) of 18 minutes 45 seconds. Jonny PENNELL was third in 18:54. Just one week after completing the London marathon Danny SUTTON ran a new PB of 22:20. Other Spartans who achieved a new PB at Stevenage were Steven DOBNER (26:31), Michael O’KEEFE (27:40) and Lynsey CHALKLEY (33:42). Roger HARDMAN joined 715 other Parkrunners on Town Moor to complete the Newcastle Parkrun in 27:55. In Hampshire Darryl STEVENS completed the Brockenhurst course in 40:46. Hannah NEALE was 4th lady in her first outing in Chipping Sodbury in 22:27. The previous week Spartan ALISON WOOD had been the fastest woman in the Stevenage Parkrun. She was 12th overall in 20 minutes 33 seconds giving her a massive age graded score of 82.56%. The first race in this season’s Mid Week Road Race will be in Epping Forest on Thursday 10th May at 7.30p.m. 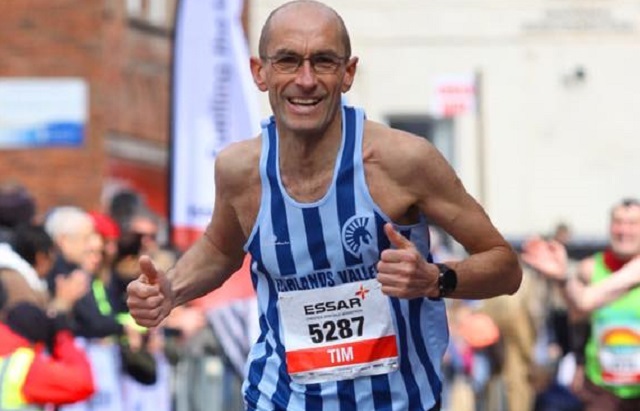 and the first event in this year’s EMAC (East of England veterans 35 plus) track and field league will be at Ridlins Track this Wednesday, 2nd May.